After partnering to co-present the Fourth annual Color Presque Isle 5K, officials with the University of Maine at Presque Isle and the Wintergreen Arts Center are calling the event a huge success. During this year’s Color PI 5K, where participants dressed in white and were showered with colored powder throughout the course, more than 300 people took to the course and nearly $12,000 was raised for local arts programming activities. Similar to other runs that have happened across the nation, this event involved volunteers dropping nontoxic colored powder on participants at various spots throughout the course, which began at Riverside Park and looped around to the UMPI campus and back. This year’s route included a stretch along Main St. from State St. to the UMPI campus, resulting in a parade of color along the city’s main roadway. The 2016 course featured six color stations, sponsored by local businesses and staffed with teams of volunteers dressed up to reflect specific themes. At the finish line, which was staffed by a team from the Aroostook Autism Support Group cheering on finishers, refreshments and water provided by TAMC awaited participants. 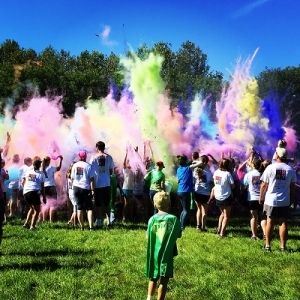 At a designated time near the end of the event, all participants and organizers were invited to take part in a giant color throw, a perennial crowd favorite. Again this year, organizers hosted a Best Costume Contest. Prizes were awarded to Jack Hallett in the kid category, Loring Job Corps Center students in the group category, and Sam White and Kevin Gunya in the People’s Choice category, with a grand prize of two round trip tickets to Boston courtesy of PenAir. To add to the festivities, during and after the event there were several activities available for participants and those cheering on 5Kers, including face painting, a community mural and KTC’s Brain Freeze Ice Cream Truck, sponsored by State Farm Insurance/John Harvell. This year’s sponsors included Blue level sponsor MMG Insurance; Yellow level sponsors Huber Engineered Woods, the Presque Isle Downtown Revitalization Committee, Presque Isle Healthy Maine Streets, TAMC, Katahdin Trust Company, Northern Athletic Supply, and PenAir; Green level sponsors Machias Savings Bank, McCain Foods, and State Farm Insurance; and Orange level sponsors United Insurance and Star City IGA. The Hampton Inn in Presque Isle and County Physical Therapy also contributed prizes for this year’s event. In addition to sponsor support, event organizers estimated that they had more than 100 volunteers help out with this year’s event. Planning is already underway for the Color PI 5K 2017, which will take place on Saturday, Aug. 26 at 9 a.m. at Riverside Park in Presque Isle. All are encouraged to save the date; details will be forthcoming soon. For photos from this year’s event, visit www.umpi.edu/colorpresqueisle5k.